The Chennai Super Kings captain Mahendra Singh Dhoni is a crowd favourite irrespective of where he plays. MS Dhoni or MSD as he is known, enjoys spectacular support all over the world whether he is playing for India or his IPL franchise Chennai Super Kings (CSK). MI vs CSK Live Cricket Score Updates IPL 2019. A similar sight was witnessed at the Wankhede Stadium in Mumbai on Wednesday in the Mumbai Indians vs Chennai Super Kings match. Mumbai Indians vs Chennai Super Kings Live Cricket Score 15th T20 Match. Though Mumbai Indians were playing on their homeground, at the Wankhede stadium, the crowd gave a loud cheer to Mahendra Singh Dhoni when he came out to bat. MS Dhoni Reaches Ranchi for India vs Australia, 3rd ODI 2019; Crowd Gives a Roaring Welcome to the Local Boy (Watch Video). This is certainly not the first time that MSD has got a welcome like that and it surely won't be the last. However, Chennai Super Kings (CSK) lost the match by 37 runs. Chasing 171 to win, CSK's top order collapsed quickly and except Kedar Jadhav, no other batsman could make an impact. Hardik Pandya of Mumbai Indians (MI) shined both with the bat and the ball. 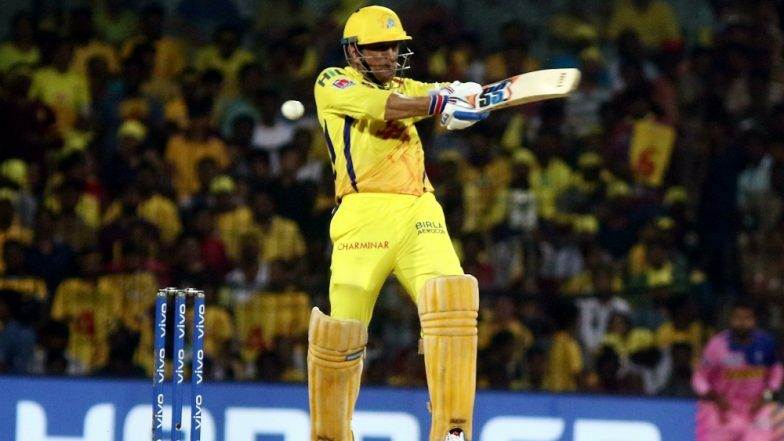 Chennai Super Kings Playing XI: Ambati Rayudu, Shane Watson, Suresh Raina, Kedar Jadhav, MS Dhoni (Captain), Dwayne Bravo, Ravindra Jadeja, Deepak Chahar, Shardul Thakur, Mohit Sharma, Imran Tahir. Mumbai Indians Playing XI: Rohit Sharma, Quinton de Kock, Suryakumar Yadav, Yuvraj Singh, Kieron Pollard, Hardik Pandya, Krunal Pandya, Jason Behrendorff, Rahul Chahar, Lasith Malinga, Jasprit Bumrah.